We are excited to announce the Richard E. Jaffe C’79 G’79 Endowment Challenge. As part of the Game Onward Campaign, any gift made to the sailing program’s endowment during this challenge will be matched dollar for dollar up to $500,000! Individuals are able to make one-time gifts or multi-year commitments which will be counted in their full amount towards the challenge goal. During the Game Onward Campaign for Penn Athletics, we are aiming to ensure the long term financial stability for the sailing program by strengthening the programmatic endowment. The ultimate goal of this challenge is to leverage Richard’s generous conditional pledge to raise $1,000,000 in total for the program, spendable income from which will have a positive impact on the program in perpetuity. We will update our progress monthly, and we hope that everyone will participate in this challenge. 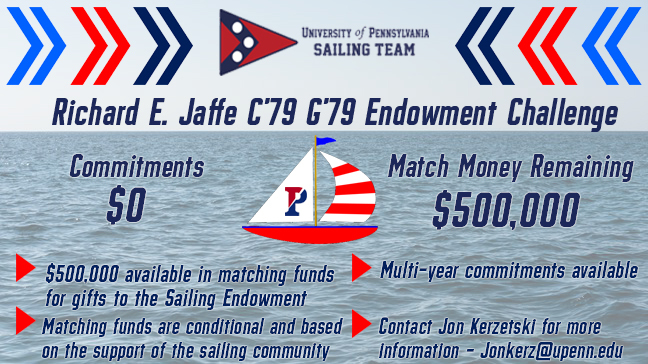 Only through your support of Penn Sailing will we succeed in unlocking these matching funds to benefit the program. A successful challenge will provide long-term stability and the funding to help lift Penn Sailing to the elite ranks of collegiate sailing. Click Here to Support the Penn Sailing Endowment Fund! Please contact Jon Kerzetski (jonkerz@upenn.edu) if you have any questions or would like more information regarding the challenge.